100+ ACRES BURN » A large brush fire near Makaha Valley Towers didn't threaten any homes but covered the area in heavy smoke. Tomorrow starts three days of input on a bill to let the ship operate while a study is done. Hawaii citizen soldiers have their marching orders -- Kuwait in 2008. The state's largest ocean shipper is making a move bound to have an effect on Hawaii's already high consumer prices. 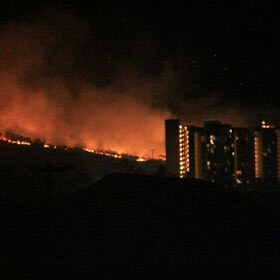 A brush fire devours 100-plus acres as smoke blankets the area near condos. The hybrid goggles had their origins in a surfer's preventive eye surgery. The Aloha Stadium Authority will be seeking bids for selling space. Leilehua found a spark with defense and special teams to rally for a 36-13 win. Lloyd Jones won the award from the Retail Merchants of Hawaii. Blank booklets for public school students' exams were mistakenly scored by a contractor.